Welcome back to the Halloween Express of Baton Rouge, LA home of LSU! We are located at 5919 Blue Bonnet Blvd. Baton Rouge, LA 70836 next to the Mall Of Louisiana and Best Buy. 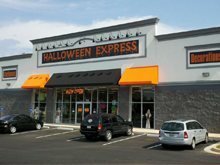 You won't find a larger selection of licensed merchandise, costumes, masks, makeup, props, decoration and accessories for this 2016 Halloween season. We look forward to seeing you this season. Stop in and our knowledgeable staff will help you with all your needs. Go Tigers! 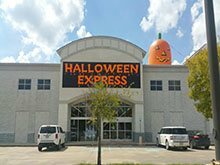 Welcome to Halloween Express of Hammond, LA! We are located in the Hammond Square Shopping Center next to Foot Locker and Sears at the intersection of I-12 and US-51. Come check out of large selection of costumes, masks, props, decorations and accessories. You can find everything you need for the 2016 Halloween season! Stop by and let our staff help you with all your party needs.